This particular model is a pull start and does not include an electric start option. As a result Honda has introduced a decompression mode for an easy start every time. Otherwise the specifications and features are pretty much the same as the TAS model previously reviewed on this web site. For example major features include a powerful engine and hydrostatic transmission. Consequently this provides a variable speed to match all kinds of situations including icy conditions, heavy snow and transport. Importantly the treads will provide excellent traction on icy situations as well. Also this model also comes with a 3 year warranty for consumer and commercial users. As a result this is one of the best warranties available. We have not used this particular machine and invite readers who have to provide their comments. Above all you can also refer to the features list later in this post about the Honda snow blower model HS928TA. Adjust the auger for unbeatable clearing ability. Self propelled, infinitely variable speed control hydrostatic drive train. In addition, remote control chute adjusts up to 210 degrees of rotation and 70 degrees of elevation. A single lever accurately adjusts ground speed without affecting auger rotation speed. Designed to prevent icing -icing guard is built into the engine. Quieter operation-muffler deflector reduces noise levels. You may want to review the full feature list for this snow blower above. However we wanted to mention that this snow blower features one handed controls allowing the operator to steer the machine. While adjusting various items with the other hand including chute rotation, direction and ground speed. Therefore, note that ground speed adjustments do not change the auger speed or throwing capabilities. This is another really great snow blower with many features that operators will appreciate. But the only issue we can see which may not bother many operators is the lack of an electric starter. The writer has an electric starter on a his own machine, a different model and manufacturer. For example we might have used the electric starter a dozen times over the past 10 years. 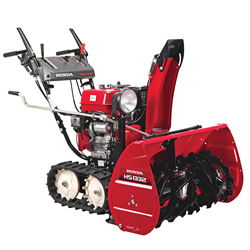 The Honda snow blower model HS928WA like all of the Honda snow blowers comes with many features that consumer and commercial operators will appreciate. Two features not included on this model that you find on some others are the electric start and the track type propulsion system. As a result this is a recoil start system or pull chord type only. However with auto decompression they make it easier to start. Double ply tires are included on this model. Other than that many of the features are the same as other models. For example hyrdostatic transmission which allows for an infinity variable ground speed to match snow conditions and or transport requirements. Regardless of the speed on the ground the impeller and auger speeds will not change. As with most snow blowers you will need to regulate the forward speed with the snow load that you encounter. 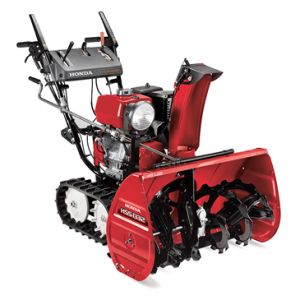 This model also has one hand controls which allow you to steer the snow blower while adjusting the engine speed. In addition the chute controls to direct the snow in the proper direction can also be adjusted by hand. As a result his makes the job of clearing snow easy and efficient at the same time. Subsequently read on for a complete list of specifications and also features for this model of snow blower. Clears up to 50 tons per hour! Easy to adjust snow deflection – up to 210 degrees of rotation and 70 degrees of elevation. Convenient control levers – single lever accurately adjusts ground speed without affecting auger rotation speed. Auger drive is equipped with easily replaceable shear bolts. This snow blower like all of the other Honda snow blowers comes with a three year warranty for both consumers and commercial operators. As a result they are confident of their product and provide a long warranty for even the frequent users of their equipment. At twenty eight inches in width, this snow blower can make short work of your driveway and parking lot. In addition it has the ability to clear up to 50 tons per hour. It will not take long to clear all of the snow that you have to deal with. Therefore take a look at all of the features listed for a complete review of this snow blowers capabilities. You can find more information about delivery methods for your snow blower. For example accessories that you can purchase, safety rules to follow, proper operation and maintenance information is all included. Therefore go to our page General Snow Blower Information, to read more about these topics. The Honda snow blower model HS928WAS is one step down from the TA models. For instance it has tires instead of the trac drive treads. Other than that it seems to have all of the regular features that Honda snow blowers are known for. this includes electric starter(you need to plug it in to a wall outlet in your garage) . Also the hydrostatic transmission that provides an infinitely variable speed transmission independent of the auger / impeller speed. As a result this is a great snow blower to consider. It also has the regular pull chord start if you do not need to use the electric start or do not have an electrical outlet close by. They are easy to start with the pull chord, with the auto decompression capability that is built-in. Consumers and commercial users will appreciate the 3 year warranty that comes with this model of snow blower. They understand that commercial users will use these machines much more than consumers. However the warranty will support this sort of daily use. Pick the right speed for you – self propelled, infinitely variable speed control hydrostatic drivetrain. Easy to adjust snow deflection – remote control chute on our two stage blowers is easily adjustable, with up to 210 degrees of rotation and 70 degrees of elevation. Designed to prevent icing – An icing guard is built into the engine. This snow blower comes with a quiet operation engine muffler. In addition it has deicing capability that protects the engine from snow and ice accumulating on the engine and on moving parts on the carburetor. Easy start pull chord, automatic decompression of the engine to enable starting by pulling the chord are among the features that come with Honda snow blowers. They also allow one handed control while the other hand is used to adjust snow throwing direction. In addition even forward speed of the snow blower. Note that as you adjust the forwards speed the speed of the auger and impeller does not change. Subsequently we mentioned earlier this snow blower comes with double ply tires instead of the tracks on other snow blowers from Honda. For information about delivery methods for your snow blower check out our web site. In addition for accessories that you can purchase, safety rules to follow, proper operation and maintenance information, go to our page General Snow Blower Information, to read more about these topics. This Honda Snow Blower model number HS928TAS has lots of features that both home owners and snow clearing contractors will appreciate. As usual we have listed the specifications first. Then we follow up with a list of features based on the manufacturers listings. This is a large 28 inch wide snowblower so it will clear your driveway in a hurry. With the tract drive most situations , even on ice, should be no problem. It does have an electric starter. However you need to attach an electric cord to start the engine. Then disconnect the cord once it is going. In addition there is also a manual backup pull chord that can also be used. I have a model like this from another manufacturer. But I just end up starting my snow blower all of the time using the pull chord. the only time I use the electric start is in a situation were I have a hard time starting it which is not often. The other major feature is the hydrostatic transmission. Which provides a variable speed capability to match just about any kind of snow condition. Honda is known for this type of transmission. As a result they use them in most if not all of their snow blowers and other residential products as well. Easy to adjust snow deflection with up to 210 degrees of rotation and 70 degrees of elevation. Quieter operation with improved muffler deflector reduces. One hand control to easily adjust snow direction and distance with the chute controls. This particular snow blower comes with a three year warranty for both residential and commercial users. Many manufacturers are unwilling to provide the same warranty to both types of users due to the heavier load that a commercial user apply. However most other features are pretty standard except for perhaps the de-icing feature which surrounds the engine in hot air and protects the engine from ice that might form in critical areas. Honda continues to update snow blower models, adding features etc every year. We are attempting to show case these models as they come out. check back often for updates and new reviews. Your comments are also appreciated as well since our readers really appreciate other consumers experiences. 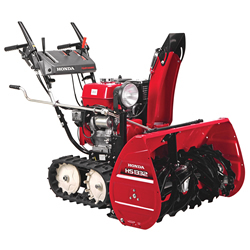 This Honda snow blower in this review is a Honda HS1332TCS with tracks instead of wheels. It comes with a dual stage, infinitely variable transmission and a powerful 337 CC engine. Consequently there are many features that will appeal to the average home owner. Especially if they need to clear a lot of snow in a hurry. As a result the powerful engine, treads for great traction and flexible controls makes this machine well worth considering. 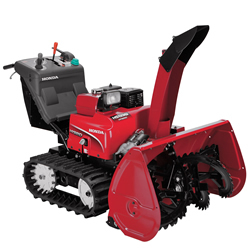 Starting with the 32 inch wide intake, this machine can cut wide swaths across your driveway or parking lot quickly. The variable speed transmission allows the operator to match snow load conditions. As a result it easily slows down or speeds up as you deal with snow conditions. There is a work light for night time operation and all controls are within hands reach of the operator. As a result you can operator the snow blower with one hand while redirection the chute with another. Honda also offers a 36 month warranty to both residential operators and commercial operators. Which is unusual in the industry. This is an electric start engine. However there is also a recoil chord for emergency starting manually. The potential accessories that can be purchased with this snow blower machine include a snow blower cover. There is also a drift breaker kit. The size and weight of this machine coming in at 271 pounds is too heavy for most people. As a result anyone purchasing this machine will also need to arrange for delivery. 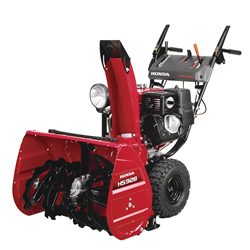 This Honda snow blower is equipped with a Honda GX340 engine, 4-stroke , OHV, single cylinder power plant. Transmission: The transmission is an infinitely variable hydrostatic transmission. As a result it allows the operator to accurately match the ground speed with the snow load. Warranty: This Honda Snow blower comes with a 36 months for non-commercial use and 36 months for commercial use warranty. This particular snow blower clears 32 inches wide at a time. It is capable of throwing the snow as far as 50 feet depending on conditions. However it is gas powered using regular gasoline. This blower has a variable speed transmission. In addition it utilizes tracks instead of wheels to provide maximum traction in all conditions. As with most snow blowers of this size it is dual stage. As a result it can throw the snow as far as it does. You can anticipate operating this snow blower from two to two and one half hours depending on conditions. However for information about delivery methods for your snow blower, etc. go to our page General Snow Blower Information, to read more about these topics. In addition this includes accessories that you can purchase, safety rules to follow, proper operation and maintenance information. 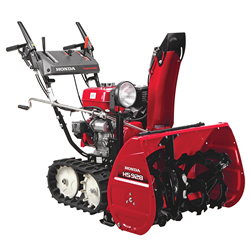 The Honda Snow Blower HS1332TA comes with an infinitely variable hydro static drive system. As a result it can be controlled separately from the engine speed and auger speed. This is unique among snow blowers. The track drive system gives superior traction compared to regular wheel drives and the auger height can be adjusted for smooth down to the pavement snow clearing, to rough ground coverage and for transport situations. 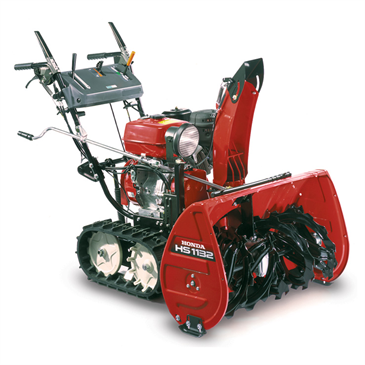 This machine provides 32 inch wide clearing in snow situations up to 20 inches of clearing height. The engine is an easy starting engine with recoil start capability. The engine automatically provides decompression for easier starting. It also comes with the standard work light for night-time operation in low light situations. The warranty is 3 years for both residential and commercial operators. Drive and engine speed controls can be managed with one hand while the operator controls the direction of the chute. Remote controls allow for 210 degrees of rotation and 70 degrees of elevation. The current MSRP price quoted $3189 for the cost of this particular snow blower. While this Honda Snow Blower model HS1332TA does not come with an electric starter, consumers can rely on this snow blower for many years of operation. Recoil starters may not be preferred by many, however with the automatic decompression feature, this snow blowers engine should be easy to start. We think that consumers may want to consider a machine with an AC starter for backup situations when there is a situation that causes a difficult starting problem. Other than that one issue, this machine clears a 32 inch swath which will deal with any area quickly and efficiently. Operators can adjust the ground speed using the variable hydrostatic drive to the speed for the situation they encounter without having to adjust the engine speed or the auger speed. Operators can also manage the engage lever for the ground speed and the engine speed with one hand while adjusting the direction of the chute with the other. They can also adjust the ground speed with this free hand at the same time. This snow blower from Honda weighs in at 265 pounds. Let the machine do the work for forward motion and steering. never try to manhandle one of these machines, they are too large and heavy. It can be really easy to steer these snow blower as long as you allow the Honda Snow Blower HS1332TA to do all of the work. The Honda Snow Blower HS1332TAS has many features that consumers and commercial companies will appreciate for snow clearing purposes. For example some of the notable features include the self-propelled variable speed hydrostatic drive with infinite speed variability. Also a tract belt instead of rubber tires which gives solid traction when you need it, 32 inch clearing width to complete those snow clearing jobs quickly and an easy starting engine with 120 volt AC electric starter. Note that there are no batteries to support push button starting. A recoil start is also included. This snow blower comes with a 3 position auger for clearing snow down to the pavement, over rough ground and for transport. the drive and engine levers can be held down with one hand and the chute position adjusted with the other. Ground speed is adjusted independent of auger speed. Current MSRP price is $3399. This Honda Snow Blower HS1332TAS comes loaded with features. As a result one really important feature is that the ground speed and auger speed are separate. In other words the auger speed can be adjusted separately from the forward or reverse ground speed with the variable hydrostatic drive. Consequently there are separate controls for the engine speed and the forward or reverse ground speeds. As a result each can be adjusted while holding the auger engage control in place with one hand. The only negative for this machine is that it does not have an electric start. For easy starting you need to plug it in and depress the started button to use the AC driven starter. In addition there is a recoil backup starter chord and there apparently is an automatic decompression feature to make starting easier. It also comes with the standard work light for night time operation. Which is useful for consumers in rural situations or in parking lots with low light availability. This machine comes in at 276 pounds, so you need to depend on it’s maneuverability rather than trying to manhandle it. It comes with a three position auger which allows easy transport between locations. Let the snow blower do the work and not you. Note that all specifications and features are subject to change by the manufacturer. Consequently check with your local dealer for the current up to date feature set and specifications of this snow blower.